Turunc Dalyan Koycegiz Lake Tour has everything you will need to make your holiday as as memorable as possible. 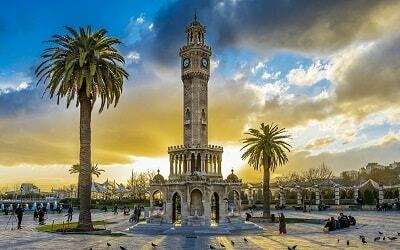 On this very special tour you will visit the best well preserved natural beauties of the western coast of Turkey. Sites such as Koycegiz Lake, Sultaniye Mud Baths, İztuzu River, Temple Tombs and the world famous Turtle Beach. 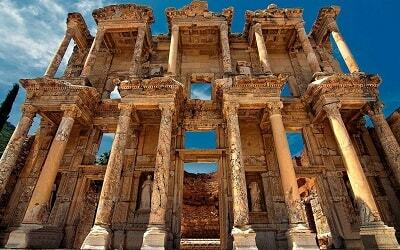 Our tour starts with a pick-up service from your hotel at 07.45 in the morning, and it is followed by a comfortable bus drive to the charming Koycegiz village. Once you’ve seen this authentic Turkish village, you will get to enjoy the breathtaking scenery while we cross the astounding Koycegiz lake by river boat to arrive to world-famous Sultaniye mud baths. 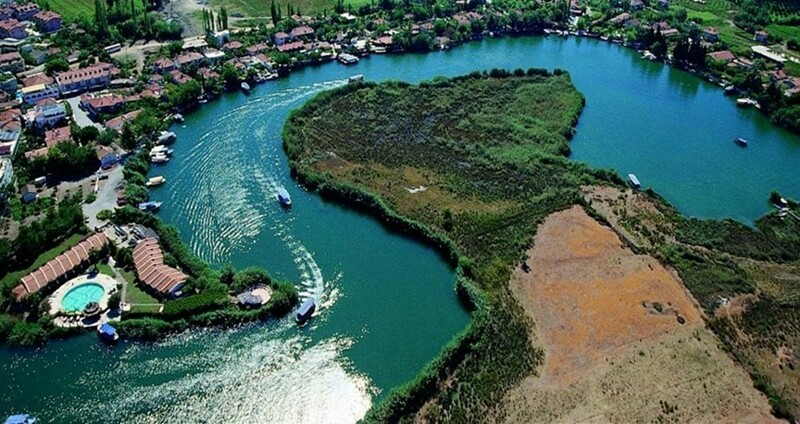 The crossing of the gorgeous Koycegiz lake is a magnificent experience on its own. Several rivers and mountain streams gather its powers and join them into this one beautiful lake, which than narrows and flows into the Daylan river. This lovely lake is a cradle of astonishingly beautiful natural scenery, full of hot springs and rejuvenating baths at all its rivers confluences. 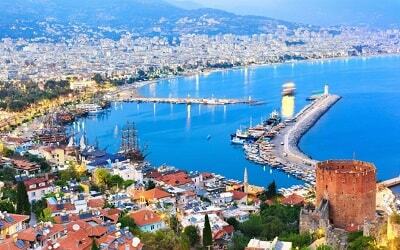 The most famous one is certainly Sultaniye spa. 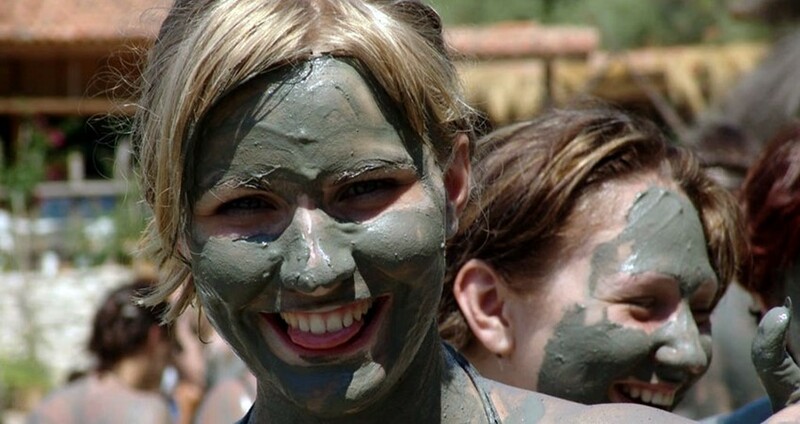 In this marvelous naturally made spa, you will get a chance to wobble in a mud bath full of minerals, and have some fun while you’re doing something beneficial for your health. Your family and friends can join in as well, because these springs are rather large and the temperature is equal wherever you stand in them. Once you’re done playing in the mud, we can continue our delightful tour. After we visit the terrific thermal springs of Koycegiz lake, we will head to the boat, where a delicious lunch will be waiting for us. As you enjoy a delicious meal, our professional guides will tell you several legends about your surroundings. You will get to hear some exciting stories and myths about the ancient Rock Tombs at the city site of Caunos. Once the tasty lunch is over, you will get to swim in the emmerald waters of the lake near the Turtle beach. 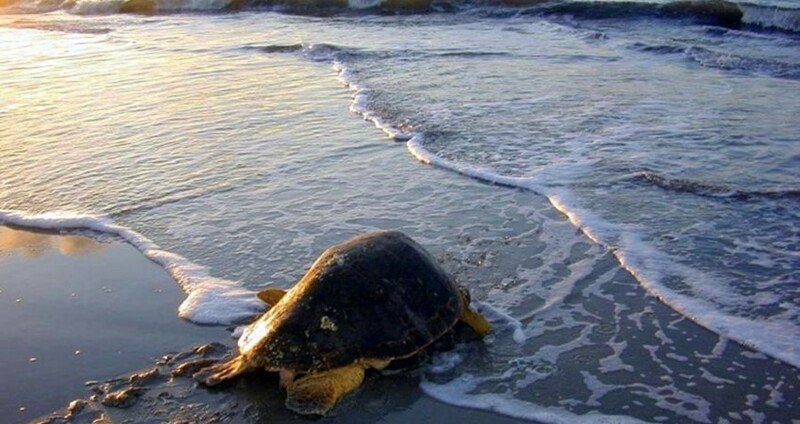 Sometimes you can see the Loggerhead turtles moving around the beach, also known as Izuzu beach, and if you’re lucky enough they might even join you for a swim. 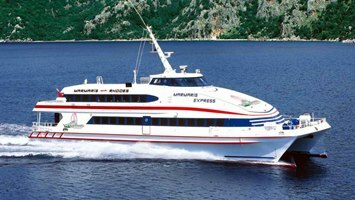 Once the adventure is over and our boat enters the harbor, our bus will arrive back to Marmaris approximately18:30. You can catch the next Dolmus to Turunc from the bus station. 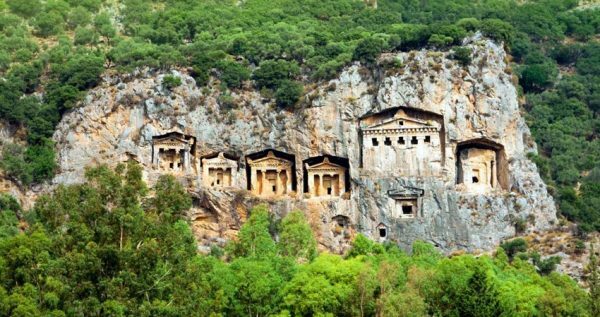 Reserve your spot on our fantastic Daylan & Koycegiz Lake Tour, and have a unique trip through some of the most captivating places in the world. 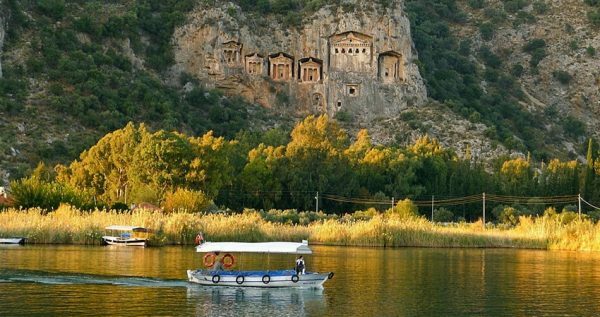 Turunc Dalyan Koycegiz Lake Tour starts with a free pick-up from your accommodation at about 8 in the morning, and it is followed by a comfy one-hour bus drive from to the charming Koycegiz village. 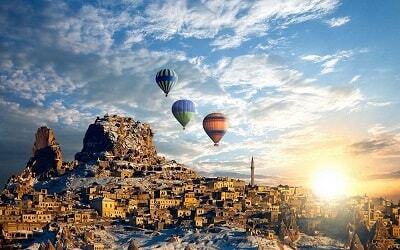 Once we arrive to this lovely village, we will board a charming river boat and sail across the great Koycegiz Lake. The crossing of this fascinating lake is a memorable experience on its own. 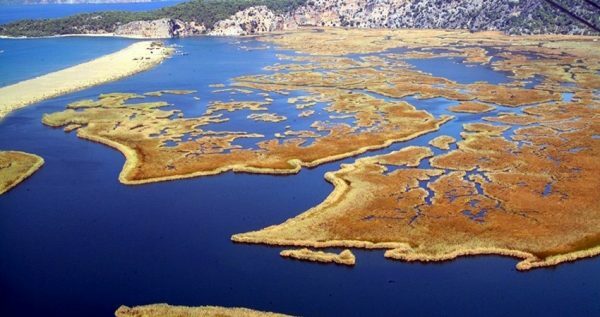 Koycegiz lake gathers its strength from numerous rivers and mountain streams, at one point this great lake narrows and flows into the Dalyan river. Koycegiz is very popular because of its natural hot springs and rejuvenating baths. One of those naturally made spas is the famous Sultaniye spa, where you will get a chance to take a fun dip in the mineral mud bath and take a pleasant dip in the thermal springs. Basically, you will have some fun time frolicking in the mud, while also benefitting your health. 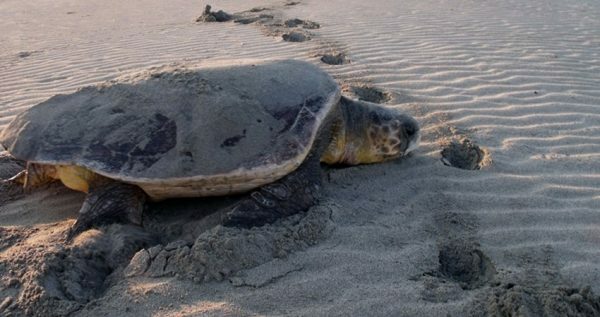 Once the lunch is over, we will stop near the unique and gorgeous Turtle beach. If you’re lucky enough you will be able to see the Loggerhead turtles moving around the beach, or even see one up close while you take your swim. 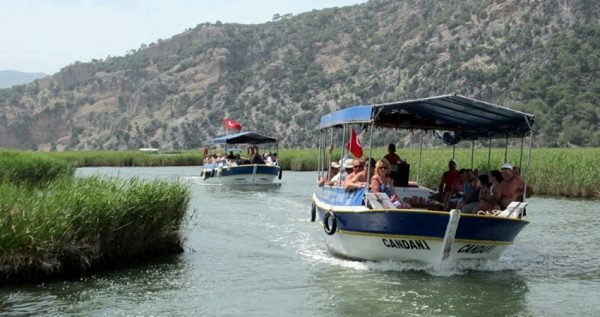 After Turunc Dalyan Koycegiz Lake Tour ends and you leave the boat, our bus will drive you to the bus station, so you can catch the next dolmus back to Turunc. Pamukkale Tour is visiting another natural beauty near Turunc.